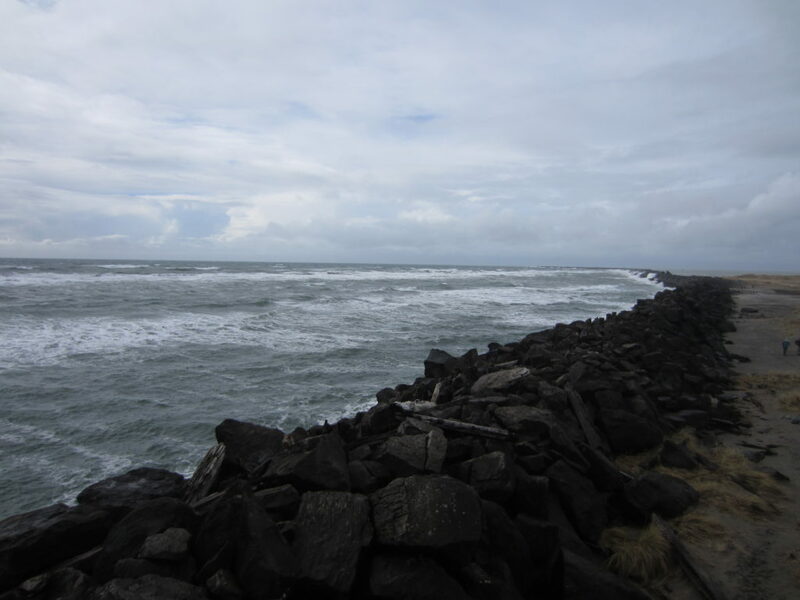 The South Jetty at the mouth of the Columbia River is a dive site that has escaped us for many years. We have never managed to be here during the right conditions to make this dive. However, we are pretty sure that you can dive the jetty in perfect conditions. Someday we’re going to get this dive. Maybe you will beat us to it! The South Jetty at the mouth of the Columbia River is almost always a rotten place to dive but every once in a while the weather is just right and this is an enticing place to dive. Someday we’ll manage to dive here. The main drive for us to dive here is the novelty of diving on the most northwesterly point of Oregon. Because conditions here are almost always rough, we have never managed to get in the water. We expect that there is good spearfishing on the jetty. There may also be some pieces of old shipwrecks but we aren’t sure. 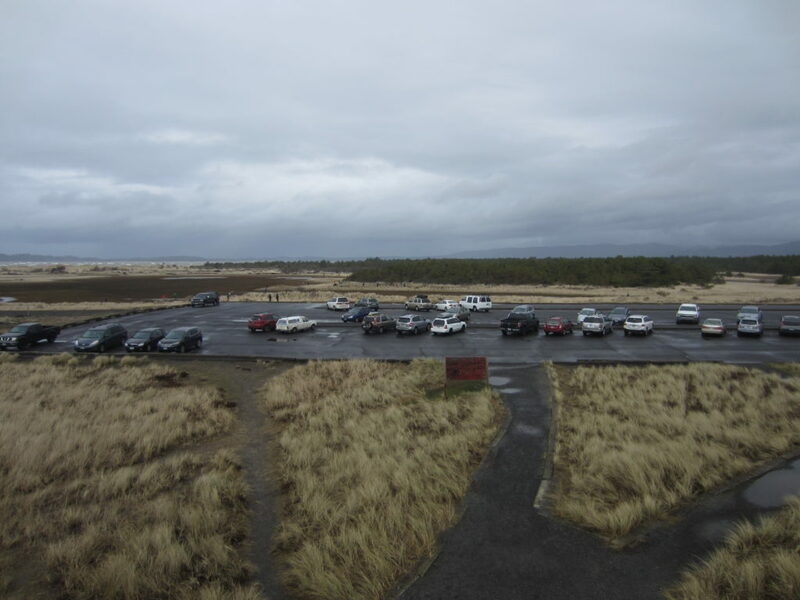 Head to Fort Stevens State Park and then follow signs for the Columbia River. Look for Parking Lot C signs. If you are going to drive on the beach, check locally for what permits you need (probably an Oregon OHV permit) and where access is available to get onto the beach. If you’re accessing the jetty from a boat, the Hammond Boat Basin on the Columbia River is the closest place to put in a small boat. Make sure you have a good captain who knows the Columbia Bar. We know of someone who died on the bar in his small open boat. His body was never found. There’s a reason that the Columbia River’s mouth is part of the Graveyard of the Pacific. There is a big parking lot right at the base of the jetty. Otherwise, you can drive on the beach with proper permits (Oregon OHV permit) and at the right time of year. This will get you closer to the site. We have not had to pay for parking at Lot C but this could change. Make sure before you park if you need to pay or not. Imagery ©2017 Google, Data SIO, NOAA, U.S. Navy, NGA, GEBCO, TerraMetrics. Map data ©2017 Google. You have to dive this in perfect conditions or you will probably get smashed on the jetty rocks, sucked out to sea, drowned by massive breakers, or worse. The site is mostly west-east. You want to stick close to the rocks and not stray far away. There can be a lot of strange currents in the area that change frequently. The south side of the jetty is deeper than the north side close into the shore. Farther west on the jetty, it gets deeper on both sides. If you’re doing a shore entrance or exit, right at the base of the jetty is where you want to hop in. If you drive onto the beach on either side of the jetty, the entrance will be easier than climbing on the massive jetty rocks. If you’re doing this as a boat dive, it’s worth heading toward the tip of the jetty for deeper water. Make sure you check out the proper nautical chart and have a good boat captain. The tip of the jetty goes underwater and can be hazardous even in good conditions. 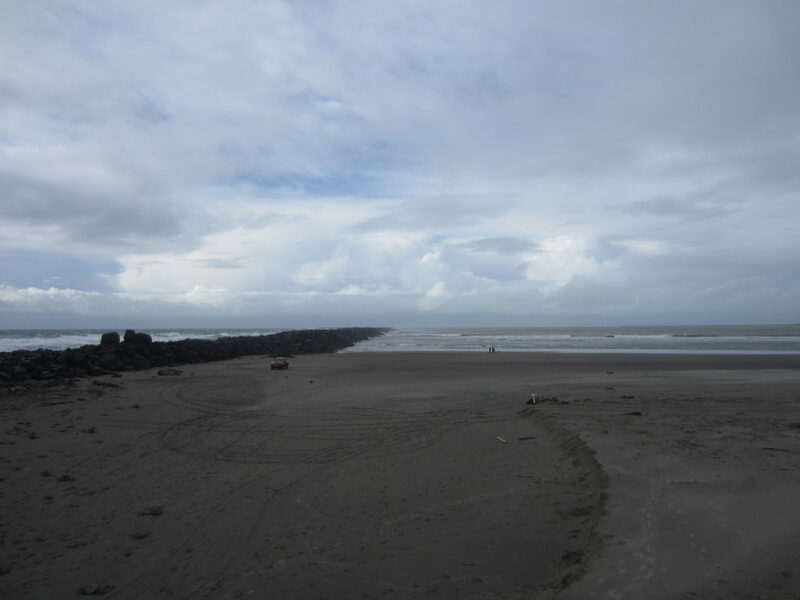 The beach on the north of the Columbia RIver’s south jetty is very long. You will have to walk through a lot of shallow water before you find a place worthwhile to go underwater. The south jetty on the Columbia River can be done either as a boat or a shore dive. When the conditions finally align with our plans, we expect we’ll do this as a shore dive. Normally it’s way too rough to dive here. Every time we have tried, the conditions are rotten. In absolutely ideal conditions, you will still have to contend with surf, surge, and current. Based on what we have been told by other divers and our own experience on nearby jetties, we expect visibility to range from 5 to 15 feet depending on conditions. This site is exposed directly to the open ocean so water temperature tracks ocean temperature. Expect to see temperatures between 45F and 55F. Parking Lot C is the closest you can get on pavement to the jetty. It’s a good place to stage before making the climb over the jetty or the long walk to the north beach. Summer and early fall when no storms are predicted is the best time to try your luck at getting a calm day at the mouth of the Columbia River. At the very tip, nautical charts show about 65 feet of water. Along the jetty where you can dive from shore, the north side won’t get much below 15-20 feet at high tide while the south side can get up to about 30 feet. You really should have rescue diver training and a lot of experience diving jetties in Oregon before you attempt this. Even then, this can be a dangerous site. This is an advanced dive that requires lots of planning and good conditions. Diving in anything less than ideal conditions is just asking for trouble. If you park in C Lot, you’ll be walking about 300 feet plus a jetty scramble for the south side of the jetty or about 1500 feet plus a long slog through shallow water (up to 2000 feet!) for the north side of the jetty. It’s possible the north side might have quicksand in the shallows so be very careful. No surface swim is necessary on most of the south side unless you’re starting from the beach in which case you might have to swim 1000 feet for deep enough water. On the north side, you’re looking at 1000+ feet of swimming to get to deep water. To dive on the beach, you need a permit (Oregon OHV). Check locally to see what the rules are. This site is not one that you can just go and do any day of the week. Weather needs to be good and ocean conditions need to be calm. Even then, the Columbia River pumps out a LOT of water and there are a lot of strange and unpredictable currents around the jetty. There is a full service SCUBA shop in Astoria with air fills. Look for the little tugboat on the back of a trailer in downtown Astoria for really good fish and chips. The state park has camping available. We haven’t tried any of the hotels in the area. Please let us know if you are aware of diver-friendly lodging in greater Astoria.